The drum is emblazoned with a zemi, a Taino deity carved in stone. The original inhabitants of Puerto Rico were Tainos who called themselves Boricua. Columbus called them "a gentle and loving people" and promptly proceeded to enslave them. The survivors of a ruthless genocide merged with enslaved Africans and poor Spanish to create a uniquely Puerto Rican culture. 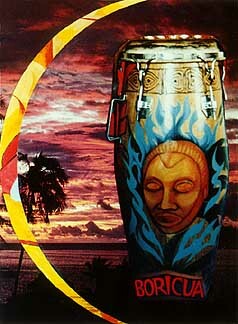 This conga drum was painted for Matu Feliciano, a Nuyorican woman drummer.